Small-caps had a great run in 2016, but what should investors expect from 2017? 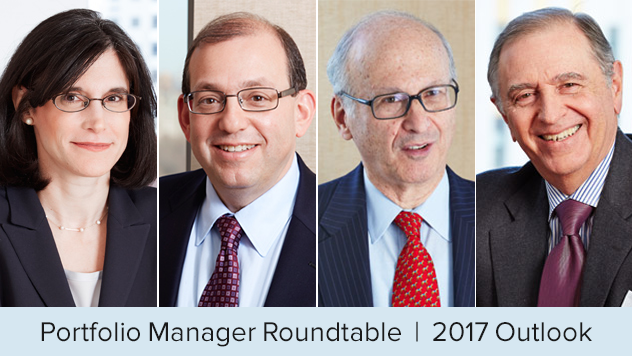 Four veteran small-cap portfolio managers share how key developments in 2016 are shaping their 2017 outlook and portfolio positioning. Lauren Romeo sees potentially rewarding long-term opportunities for small-cap stocks with strong business fundamentals. Propelled by the post-election "Trump bump," small-cap stocks as a whole now appear to be discounting many of the favorable macroeconomic scenarios that could unfold in 2017. Some performance may have been pulled forward into 2016, leading to more modest returns in 2017. Deviations from expectations or delays in implementation of the new administration's proposed plans may heighten investor uncertainty and market volatility. In addition, not all potential actions and byproducts will be positive for business, for example, trade protection and/or a stronger dollar. Any resulting pullbacks for small-cap stock prices, however, should create potentially rewarding long-term opportunities given that many of the market trends which have benefited our investment approach still seem to be in the early innings. These include a shift in market leadership to small-cap value from growth (particularly non-earners), a rotation to cyclical stocks from defensives, the normalization of interest rates, and a decline in correlations and increased market breadth. As 2016 marked the reversal of what had been a multi-year relative performance run for small-cap growth, defensives, and non-earners, it seems that a run for cyclicals, earners, and value in small-cap still has a way to go. Our high-quality company focus did well in this environment and could continue to do so if this situation continues. As evidenced by 2016, these conditions are conducive to small-cap performance being driven by individual companies' business fundamentals. They should thus work to the advantage of judicious stock selection more than sector allocation or momentum. Additionally, as the cost of debt capital rises, balance sheets will matter more and more, particularly with the leverage ratio (Debt/EBITDA) for the Russell 2000 currently near past highs. Based on our meetings with companies since the election, management confidence, along with that of their customers, has increased, which could create a virtuous circle of accelerated U.S. economic growth. Our bottom-up approach has led us to continue to own companies with durable, high-ROIC business models trading at attractive valuations in pro-cyclical sectors, including Industrials (companies with significant operating leverage that should produce faster absolute and relative earnings growth when revenue growth picks up) and Consumer Discretionary (favorable employment trends, wage gains, and low energy prices are supportive of increased personal consumption expenditures). Within Financials, select asset managers and financial advisory firms have priced in a fair amount of negative expectations (though in the near term the stocks tend to rise and fall with capital market gyrations). While the sector has been on a multi-year run, Health Care may prove a more fertile hunting ground if stocks continue to underperform—it was the only negative sector in the Russell 2000 in 2016. Increased regulatory and legislative uncertainty may create valuation dislocations in individual stocks that have been undeservedly tarred with the same brush as the sector as a whole. Jay Kaplan sees the possibility of lower corporate tax rates and increased infrastructure spending as promising developments for 2017, and is cautiously waiting for more attractive valuations. Small-cap stocks really took off after the election, accelerating the already fast pace of returns in 2016. This upswing has occurred without any meaningful correction following the mid-February low, something that puts a fair amount of risk into small-cap share prices. So while I'm very pleased with 2016's results, I think it's also important to point out that the kind of high double-digit run small-caps enjoyed is not sustainable without some retrenchment, especially given how rich valuations looked at the end of 2016, I see that as a headwind as we enter the new year. Patience is key right now. I expect interesting buying opportunities to materialize when some of the current widespread optimism dissipates. I'm prepared to wait. And if we do get a correction, I'll act opportunistically, consistent with what I've always done when the market goes south. At some point in 2017, we may see a lower corporate tax rate, repatriation, deregulation, and increased infrastructure spending from the new administration and Congress. These developments all look very promising. Increased infrastructure spending would boost cyclical stocks, while a lower corporate tax rate would be a positive for most small-cap stocks regardless of sector. In another positive sign, the Fed's decision to raise rates in December showed that they are bullish on our economy. Yet there are still some important questions: How much of the positive effect of these policy changes have newly confident investors already priced in? How many of these changes will actually take effect in 2017? Will a delay in implementation tamp down investor optimism? What effect will higher interest rates have? Along with a strengthening dollar, which would be a headwind for industrial stocks, the uncertainty behind the timing and extent of these proposals creates additional risk. There is no guarantee that we'll see more robust GDP growth this year, though many equity investors are behaving as if we will. If GDP growth stalls in the first half of the year, that could spur a correction. As 2016 drew to a close, I was working to high-grade my portfolios. While many of my holdings looked pretty richly priced, I'm generally hanging on to those that have a combination of high quality and strong fundamentals and selling or significantly trimming those that looked even more richly priced or have more business risk than I'm willing to tolerate at their current valuation. Given my contrarian approach, it's been hard to find exciting new ideas because most of the cheap stocks I've been investigating have turned out to be priced that way for very good reasons—they look like classic value traps. Patience is key right now. I expect interesting buying opportunities to materialize when some of the current widespread optimism dissipates. I'm prepared to wait. And if we do get a correction, I'll act opportunistically, consistent with what I've always done when the market goes south. An absolute value investor, Charlie Dreifus is cautiously monitoring an investment climate marked by increased confidence and sees U.S. small-caps as a sweet spot for current asset allocation. The increased confidence in the equity markets is good. It removes the excessive hesitancy that we observed in 2016. Overconfidence, however, is usually a sign of a market top. Have investors pulled forward 2017 returns more than sufficiently? I think so. Clearly, they have already discounted better growth. Perhaps the market is priced to perfection already with no margin of safety for delays, errors, or world events. Prior to the election, I thought that the market was attractively valued only relative to the 10-year Treasury. Since then, the market has risen (thus lowering my cap rate), as has the yield on the 10-year (thus raising the cost of capital), leaving one to conclude that the market is now even less attractive than it was before the election. As a result of unstable economic conditions in many areas outside the U.S., a rising dollar, and the fact that U.S. small-cap companies stand to gain the most from a lower tax rate, U.S. small caps are being recognized as the sweet spot for current asset allocation. I would not be at all surprised if the market pauses now to digest its recent advance while also trying to calibrate how well or incorrect expectations are versus actions it sees on the paths to successful implementation. I am concerned that perception has overtaken the likely reality. We hope, and expect, Reaganomics 2.0, but Smoot-Hawley 2.0 cannot be ruled out. It also must be said that the Reagan era had a very different (that is, more favorable) backdrop. Equity valuations as a percentage of GDP are now 196% versus 40% in 1980. Non-financial debt as a percentage of GDP was 135% then; it is 251% now. U.S. federal government debt was 30% of GDP then; it stands at 100% today. Interest rates were declining from lofty levels while today they are rising from suppressed levels. Considering the market's strength and resilience, there is too much complacency and perhaps too much current emphasis on direction and strength, as opposed to valuation. Bullishness is too pervasive, even if current levels of equity investment appear to indicate otherwise. Presuming lower tax rates, many investors are also deferring capital gains into 2017 so that selling could actually pick up early in the new year. In any event, reality will set in after January's inauguration. While not a concern with our portfolio, because our companies generally have little to no debt, there is a potential headwind for other small-cap companies in the form of rising interest rates. For companies in the Russell 2000, 51% of debt is floating rate while for those in the S&P 500, it is only 9%. The backdrop is perfect for high active share portfolios. Stock picking is 'in' again, as market correlations have dropped, valuations are extended, interest rates have risen, and earnings results are more dispersed. Granular portfolio construction once again matters, which should benefit us. Buzz Zaino foresees higher interest rates in 2017, along with business improvement momentum, a stronger economy, and increased federal spending. The market will experience both headwinds and tailwinds in 2017. The biggest headwind will likely be higher interest rates, which is essentially a tax on consumers that reduces spending and creates higher interest costs for the government, which will increase the federal deficit. The performance of small-cap stocks in 2017 depends on a growing economy and higher earnings. We are focused on areas that should ultimately benefit from the tailwinds including non-residential construction, industrial companies, and technology companies. We are emphasizing those very cheap stocks that we think are likely to benefit from a stronger economy. A headwind may also result from uncertainty around federal spending. As the new administration populates various agencies, it will be at least into the second half of the year before specific spending plans begin to be implemented. Lastly, subdued international trade while the various participants hesitate until U.S. policy is defined could also impede the market's progress. As for tailwinds, there is the momentum of business improvement since the election and pent-up demand from the inhibited environment of the six months prior to it. In addition, employment is strong, and consumer balance sheets are in better shape. Finally, expansionary fiscal policy should ultimately be implemented at a reasonable pace assuming the conservative Congress restrains spending so as not to balloon the federal deficit. We think the headwinds will be more prevalent in the first part of the year before giving way to a better environment in the second half. Since the rally has initially priced in the tailwinds, the market may not expand until a clearer picture of federal policy can be established. Tax policy is uncertain, for example, and any beneficial effects may not be felt until late 2017. The performance of small-cap stocks in 2017 depends on a growing economy and higher earnings. We are focused on areas that should ultimately benefit from the tailwinds including non-residential construction, industrial companies, and technology companies. We are emphasizing those very cheap stocks experiencing turnarounds in which we have identified a catalyst for improvement and that we think are likely to benefit from a stronger economy. The thoughts and opinions of Messrs. Zaino, Dreifus, Kaplan, and Ms. Romeo concerning the stock market are solely their own and, of course, there can be no assurance with regard to future market movements. No assurance can be given that the past performance trends as outlined above will continue in the future. All indexes referenced are unmanaged and capitalization-weighted. Russell Investment Group is the source and owner of the trademarks, service marks, and copyrights related to the Russell Indexes. Russell© is a trademark of Russell Investment Group. The Russell 2000 Index is an index of domestic small-cap stocks that measures the performance of the 2,000 smallest publicly traded U.S. companies in the Russell 3000 Index. The S&P 500 is an index of U.S. large-cap stocks selected by Standard & Poor's based on market size, liquidity, and industry grouping, among other factors. The performance of an index does not represent exactly any particular investment, as you cannot invest directly in an index.